In this course, you will learn the scope of medical and treatment errors within the overall healthcare system and specifically in behavioral health settings. You will explore the types of medical errors, including error-prone situations, and the use of root cause analysis to determine why and how an error occurred. You will explore some best practices that will help improve client safety and outcomes within your organization. Finally, you will learn your responsibilities regarding the reporting of medical errors. With this information, you will be empowered to create a safe environment in which clients can get the care they need. Identify the scope of treatment and medical errors within the healthcare setting. Define the various terms used to describe and categorize treatment or medical errors. Describe analysis methods used to determine why and how treatment errors occur. 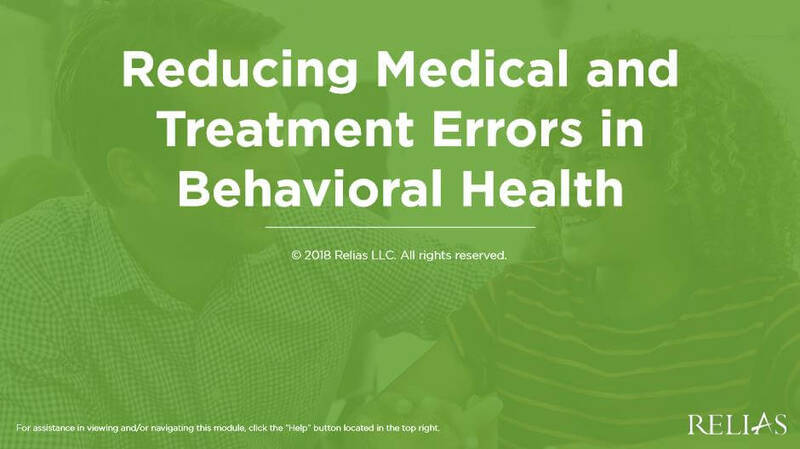 Identify strategies to reduce behavioral health treatment errors. Identify your responsibility in reporting medical errors. Angela Giles, DBH, LCSW, is a Faculty Associate in the Doctor of Behavioral Health Program in the College of Health Solutions at Arizona State University. She is also a Licensed Clinical Social Worker for the Veterans Health Administration (VHA). She received a Doctor of Behavioral Health degree from Arizona State University. She also received a Masters of Social Work degree from Virginia Commonwealth University, in Richmond, Virginia. Dr. Giles has nearly 20 years of experience in the fields of integrated behavioral health, juvenile justice, inpatient and outpatient mental health. In 2007, she helped launch the Primary Care Mental Health Integration program. She has been involved in cutting edge VA National initiatives in the field of behavioral health. Dr. Giles was featured on the Public Health Minute, a radio show which is on 10 public radio stations, including National Public Radio (NPR). The Public Health Minute reaches 2.5 million listeners nationwide each week. Disclosure: Angela Giles, DBH, LCSW has declared that no conflict of interest, Relevant Financial Relationship or Relevant Non-Financial Relationship exists. The target audience for this course is: entry level Alcohol and Drug Counselors; entry level Marriage and Family Therapists; entry level Professional Counselors; entry level Psychologists; entry level Social Workers; Nurses; in the following settings: Health and Human Services.